Now, we have all heard that in parts of Asia they eat some pretty strange things, like in Thailand, it’s a delicacy to eat Balut, a chick embryo inside an egg, as a snack from the street, in South East Asia, the consumption of Chicken feet are common, but in Cambodia, they do have a tradition of frying up insects, such as scorpions, spiders and those types of protein rich foods. We forgot where they eat cockroaches, can anyone tell us? So, in an episode that looks like “When Hippie Mom’s Go too Far”, Angelina Jolie can be seen tucking into Tarantulas and Scorpions with her kids. Amazing! Just when you thought that Angelina Jolie seemed like a sort of traditional Hippie Mother that’s really into Yoga, that you’d find out in India or even in Bali, then this footage broke just yesterday in the BBC World Exclusive Interview, Angelina Jolie showing all her good family values, then something as bizarre as this emerges… This is next level Hippie Momma stuff. “Take the fangs out” she says. Mmmm, crispy or chewy? We wonder? Scorpion’s have been known to be cooked up as snacks in parts of Central and even South East Asia, “Yes”, as a snack? “Yes”. “Crickets and beer” says Angelina. After her interview yesterday, which focused mostly on her new film, ‘First They Killed My Father’, the BBC reporter asked Angelina Jolie about the rise of populism and she responded with the need for diversity and teaching right from wrong, which was nice to hear. She does speak very well and she also touched lightly on how she is coping during the divorce from Brad Pitt, saying, “My focus is my children, our children and my focus is finding this way through”. A very nice BBC World Exclusive interview with Angelina Jolie and she seems calm, humble and diplomatic, but then comes the late afternoon snacks of cooked spiders, crickets and scorpions. 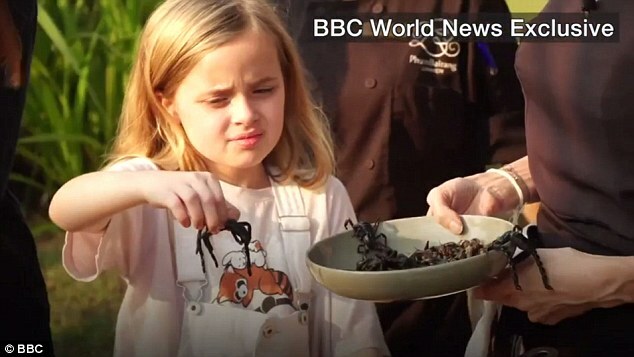 Perhaps, this would be considered as an odd thing to partake in, especially with your children joining in to try the insect delicacies of Cambodia. She went from Hippie Momma, to Extreme Hippie Momma in the space of mere minutes. Perhaps, this was what Brad Pitt had reportedly become upset about, the strange parenting and unorthodox teachings onto the children? Hey, but maybe they’re good? Don’t knock it until you try it, as they say…. A fried Tarantula, anyone? Anyone? We’d love to go to Cambodia one day, but we don’t think we will indulge in this afternoon snack.